Q: According to reports, at a meeting of the UN Security Council on September 26, the US leader accused China of trying to interfere in the upcoming US mid-term elections in retaliation for the US government's trade policies on China. What is your comment? A: State Councilor and Foreign Minister Wang Yi already made clear China's stance in his immediate response to such accusation at the UN Security Council. 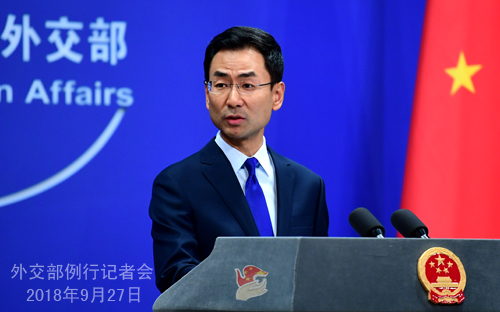 As a diplomatic tradition, China has been committed to the principle of non-interference in other countries' domestic affairs. The international community knows that already. The international community also knows who is so used to frequently interfering in other countries' domestic affairs. 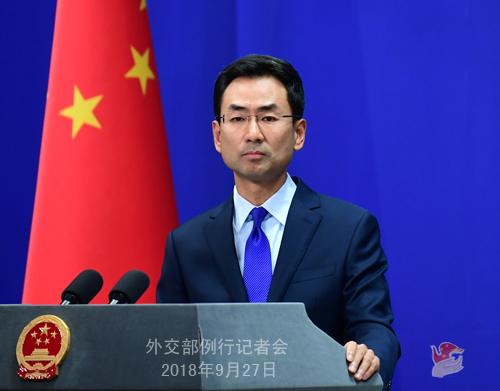 We urge the US to stop its unwarranted accusations and slandering against China and stop doing or saying anything to hurt bilateral relations and the fundamental interests of the two peoples. 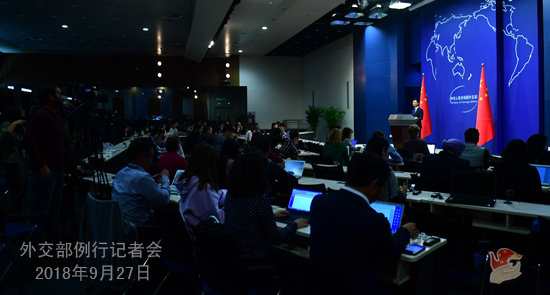 Q: The US leader said that China Daily placed propaganda ads in the Des Moines Register and other papers which were made to look like news, because they want to influence American farmers. What is your response? A: According to US laws, foreign media could have various forms of cooperation with US media. China Daily putting up a paid piece on the Des Moines Register is just one of those forms, as I understand. Many foreign media do that. It is absolutely far-fetched and fictitious to paint such normal cooperation as the Chinese government trying to interfere in the US election. Q: Is President Trump lying or mistaken when he accused China of interfering in the mid-term elections? A: Like I said just now, as a diplomatic tradition, China has been committed to the principle of non-interference in other countries' domestic affairs. The international community knows that already. The international community also knows who is so used to frequently interfering in other countries' domestic affairs. Q: State Councilor and Foreign Minister Wang Yi met with DPRK Foreign Minister Ri Yong Ho on the sidelines of the UN General Assembly in New York yesterday. The DPRK agreed that the foreign ministries of the two countries should maintain close communication and coordination. Do the foreign ministries of China and the DPRK have the plan for mutual visit soon? A: As friendly neighbors, China and the DPRK maintain normal exchanges and cooperation. The foreign ministries of our two countries also remain in effective communication and coordination. If there is any important exchange between our foreign ministries, we will issue relevant information in a timely manner. Q: It is reported that the US fighter jets recently flew over the South China Sea and East China Sea. Do you think that this has anything to do with President Trump accusing China of interfering in the US mid-term elections? A: We have noted relevant reports. We will further verify the relevant situation. What needs to be pointed out is that China respects and upholds the freedom of navigation and overflight all countries enjoy under international law, but firmly opposes the relevant country impairing the sovereignty and security of the littoral countries and disrupting regional peace and stability under the pretext of freedom of navigation and overflight.